Racquet Game Scorer (Tennis, Table Tennis, Badminton and Squash, Pickle Ball). Score, create stats, add players,send, review stats during, after game. Singles and doubles play. Automatic scoring adjustment. Review players match, career stats. Players can be added/edited. Setup players club player matches, competitions. Can be used as a coaches, trainers aid. Easy and intuitive to use. Also contains Media Player. Featuring onLine Radio with 250+ world wide stations, play local device music , videos (mp3,flac,avi etc). Play various Sudoku and Tic-Tac-Toe games. 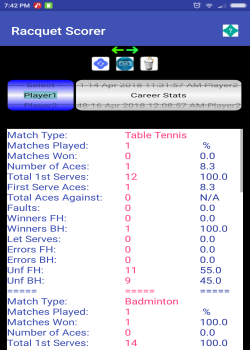 Racquet Game Scorer is a very interesting app with a pretty innovative and unique concept. With this app, you can follow the development of any tennis, squash, ping pong, or badminton game on your smartphone. If you're looking for a tool to help you keep score, then look no further, because you've just found the perfect app. 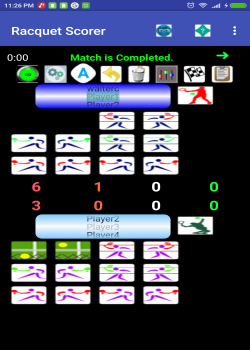 With Racquet Game Scorer, you can keep track of the points won by each player in any of the previously mentioned sports. For each sport, you'll find a design perfectly adapted to its characteristics. You can also customize the app according to the circumstances of the match: number of players, number of sets, player stats, etc. Racquet Game Scorer can be used professionally or personally depending on your needs. With this app, you can track the progress of a professional match as well as an amateur one. There are two ways to keep track of the points. The first way involves keeping track of every move the player makes and whether it was in or out. The second, which is more simple, is simply tapping on the player that won the point. 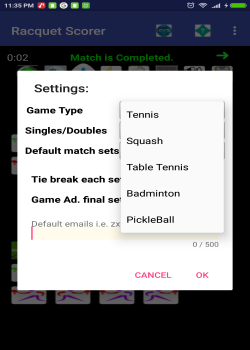 Racquet Game Scorer is an original and unique app that you can use to keep track of any tennis, squash, ping pong, or badminton match in an easy and effective way.